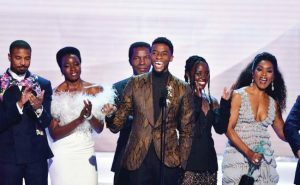 The cast of ‘Black Panther’ at the 2019 Screen Actors Guild Awards. Ryan Coogler’s groundbreaking Hollywood superhero film Black Panther made history Sunday night, Janaury 27, 2019, by winning the Screen Actors Guild (SAG) Award for outstanding performance by a cast in a motion picture. Not only is the Disney and Marvel Studios tentpole the first superhero picture ever to be awarded best ensemble; it’s the biggest-grossing film to walk away with the guild’s top honor. Last year, Fox Searchlight’s Three Billboards Outside Ebbing, Missouri won. That film went on to earn $159 million worldwide, including $54.5 million in the U.S.
Black Panther‘s worldwide earnings include a North American tally of $700.1 million — the third-best showing of all time for any genre behind Star Wars: The Force Awakens ($936.7 million) and Avatar ($760.5 million, adjusted. Black Panther is unprecedented in being a big-budget studio tentpole featuring a virtually all-black cast. Chadwick Boseman stars as T’Challa/Black Panther alongside Lupita Nyong’o, Michael B. Jordan, Danai Gurira, Daniel Kaluuya, Letitia Wright, Winston Duke, Angela Bassett, Forest Whitaker and Andy Serkis.